After suffering a historic Game 2 meltdown, the No. 1 Golden State Warriors assumed control of the series with a 132-105 Game 3 trouncing of the No. 8 Los Angeles Clippers. Kevin Durant had his best game of the postseason with 38 points on scorching 14-for-23 shooting along with seven assists and four rebounds in just 29 minutes. Stephen Curry scored 21 points in 20 minutes, while Lou Williams paced the Clippers with 16 points and six assists. The defending champions will look to keep that momentum rolling when Game 4 takes place on Sunday at Staples Center in Los Angeles. Here's everything you need to know about this first-round matchup between the Warriors and the Clippers. Clippers: The Clippers are one of the feel-good stories of the postseason, as not too many picked them to be there prior to the season's start. They will have their hands full when it comes to the Warriors, but the matchup should provide the team with some solid experience regardless. 1. Steve Kerr vs. Doc Rivers: Two of the game's premier coaches will go head-to-head in this series. Both have had ample success in the postseason, and both know what to expect. Playoff basketball becomes much more of a chess match, as teams play each other multiple times in a row, and it will be interesting to see how these two counteract each other. 2. Patrick Beverley vs. Steph Curry: Beverley likes to make things as difficult as possible for his opponents, and he will surely be tasked with trying to slow Curry at times throughout the series. A matchup between the league's deadliest shooter and one of its most tenacious defenders promises to be exciting. 3. Draymond Green vs. His emotions: Green led the league with 16 technical fouls during the regular season, and his emotions have gotten the best of him in the postseason in the past. 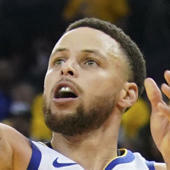 The Warriors won't want to lose Green for a game due to suspension (we all remember what happened when that occurred in 2016), so he will have to try to keep himself in check.